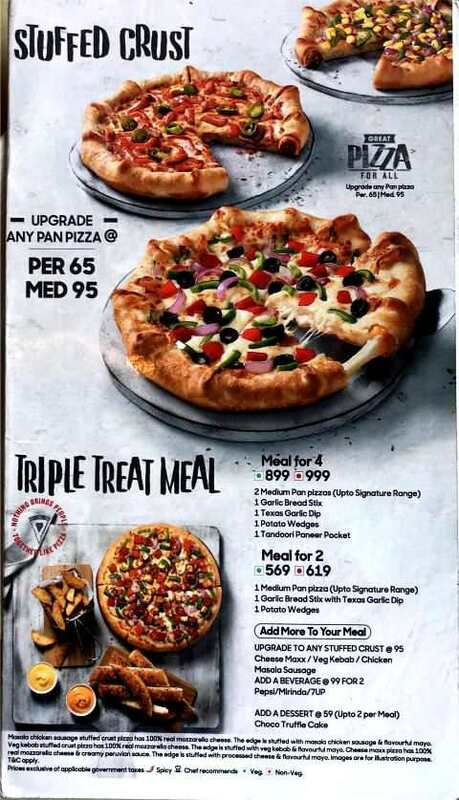 Find Pizza Hut Menu Card with Prices. 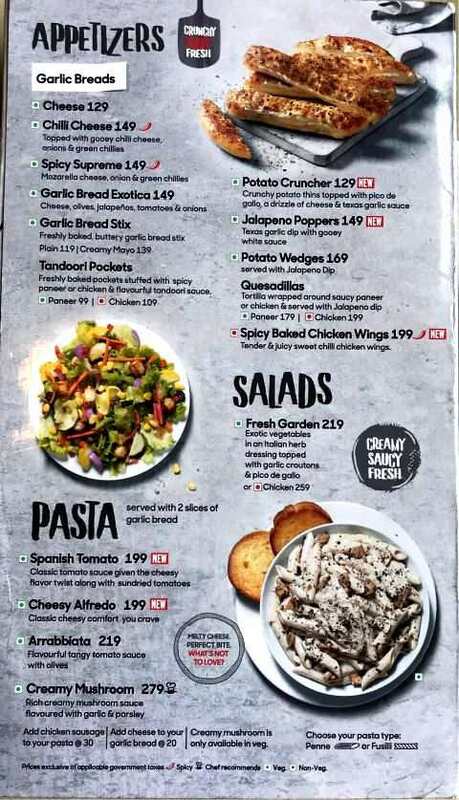 This is the latest Menu Card available at Pizza Hut, Ansal Plaza, Palam Vihar, Gurgaon. The prices are subject to change. This is the verified Menu in ist week of August 2018. Pizza Hut is an American Chain of restaurants around the world. It was founded by founded by Dan and Frank Carney in 1958. Pizza Hut Menu includes Pizza and Pasta both, therefore, it is popularly known as American-Italian Cuisine Restaurant. 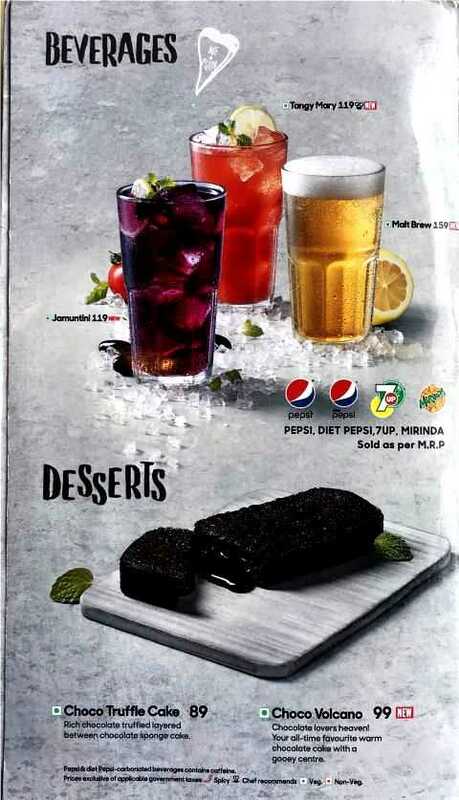 There are plenty of side dishes and desserts in the Pizza Hut Menu Card. 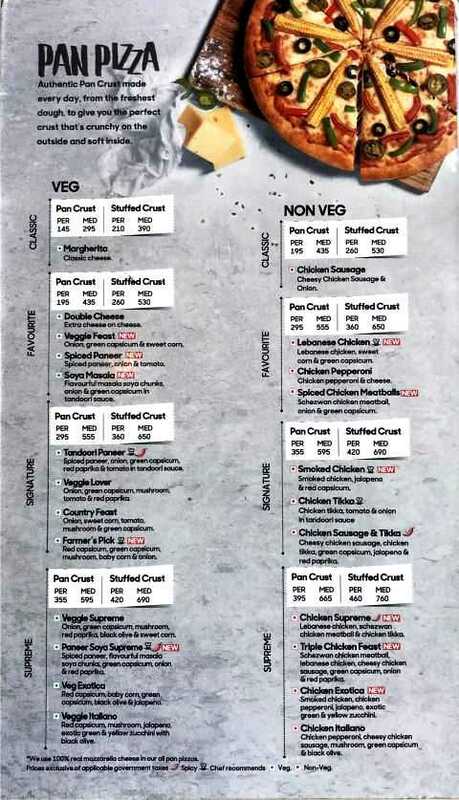 Pizza Hut Menu is in different formats at different places. There are some of the Pizza Hut restaurants which offer Lunch Buffet on their Menu Card. Buffet includes all that you can eat, Pizzas, Salad, breadsticks, desserts, and the Pasta Bar. Pizza Hut keeps introducing new Products in their Pizza Hut Menu and discontinues the less popular ones. In India ‘Pan Pizza’ is very popular. It is baked in a pan and has got a crispy edge. There is Stuffed Crust Pizza. Its edges are wrapped cylindrically with mozzarella cheese. Then, there is ‘Hand Tossed’ Pizza which is thin and crispy as the traditional one. 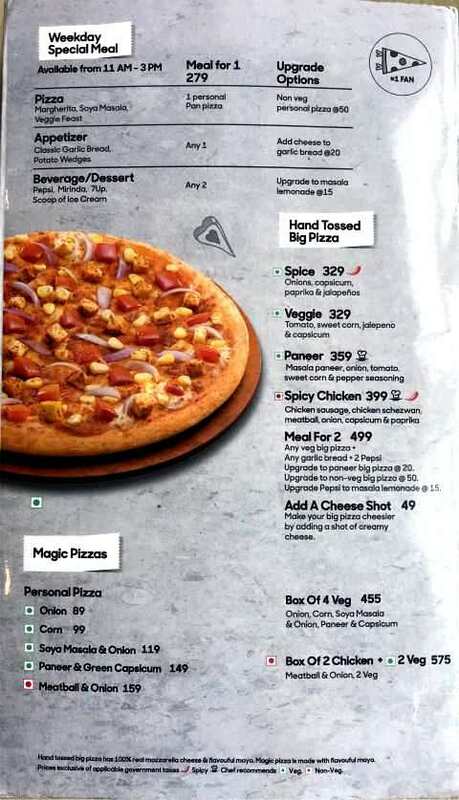 Pizza Hut India Menu includes Dippin’ Strips Pizza. This Pizza is cut into small strips to eat with different sauces. There is a Big Foot Pizza too at some of the restaurants. We are giving here below the 6 pages Pizza Hut Menu. 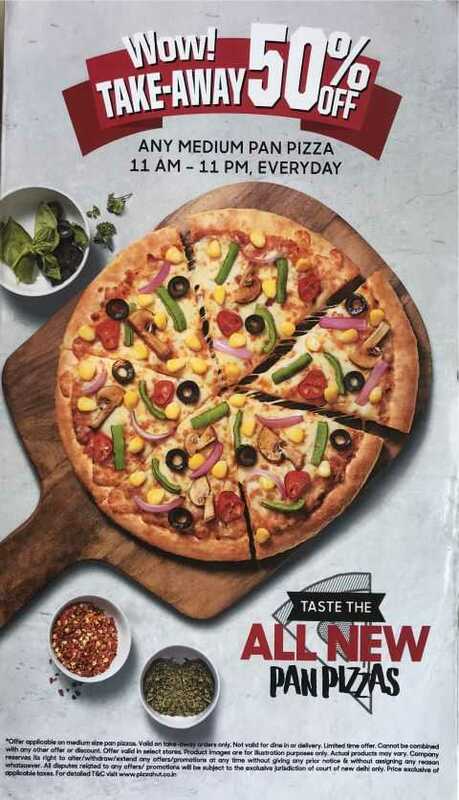 Check out 18 pages Jumbo Pizza Hut India Menu available in this blog. Today there are about 17000 restaurants worldwide. They have their presence in the major countries such as USA, Canada, India, Pakistan, Bangladesh, New Zealand, Europe, South American Countries, Middle East and Far East Countries. 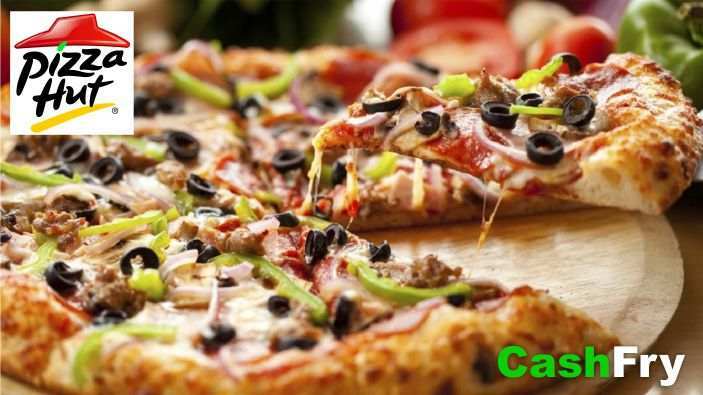 You can place an order for Pizza at your nearest Pizza Hut Restaurant at Swiggy, that too at Discounted Price with Swiggy Coupon Code and Swiggy Coupon Codes at CashFry. There are other food delivery portals such as Zomato, and FoodPanda. You can choose any of the three portals. You can also make Pizza at Home. Check out How to make Pizza at Home.